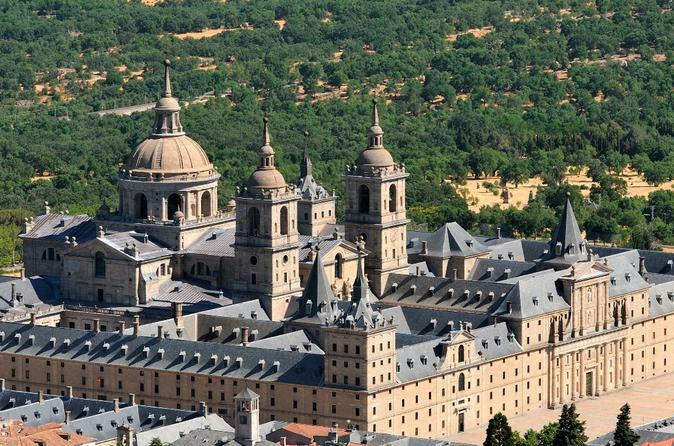 Discover the magnificent Monastery of El Escorial, Valley of the Fallen and visit the "Imperial City" Toledo on this day tour. This full-day tour is a combination of 2 half-day tours. Start your visit of Escorial in the morning and after a break, you'll begin a tour of Toledo in the afternoon finishing in Madrid. Tour with lunch is available, depending on option selected. Lunch will be taken in Madrid, between both half-day tours. monument was declared of Artistic and Historic interest, and “Mankind Heritage”. The visit include the Monastery, the Cloister of the Four Evangelists, the Palace of Philip II, Pantheons of the Royal Family, the Chapterhouses, and the Basilica. Valley of the Fallen is a monument built as a memorial of those who died during the Spanish Civil War in 1936. Located in a beautiful valley in the Mountains of Guadarrama, this impressive work has a colossal cross over 150 meters (492 feet) high, and the Basilica and Crypt excavated in the hard rock under the mountain. This tour includes the entrance to the Valley and visit inside the Basilica. Toledo is like an immense museum of great beauty and holds some of the most genuine historical Spanish monuments. Its old Gothic and renaissance buildings, its narrow streets and alleys, testify old days of magnificence. The old city has been considered as a National Monument, and declared World Heritage City by UNESCO. Toledo is also named the city of Three Cultures, as for a long period of time, the Christian, Islamic and Jewish lived peacefully within its walls. Toledo has a history in the production of bladed weapons, which are now popular souvenirs of the city. The old city is located on a mountaintop with a 150 degree view, surrounded on three sides by a bend in the Tagus River, and contains many historical sites, including the Alcázar, the cathedral (the primate church of Spain), and the Zocodover, a central market place.